Earn $35 per hour! Instant download! Start learning today! You’re intelligent, literate and well educated. There’s almost nothing standing between you and the reality of earning $35 per hour as a proofreader. That ‘almost’ is an effective proofreading course. Problem is, they’re a little expensive. 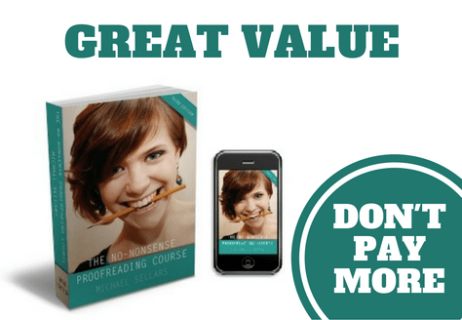 Proofreading courses can cost in excess of $300. But what if I told you I could set you on the road to securing paid, professional, proofreading assignments for a fraction of that? “I am one of those many fools who paid a huge amount of money for a useless course. I now look on Mike as my mentor as I embark on a career. Thank you Mike.” Emma Steel, Proofreader and International Structural Editor. ​“What can I say? Worth every penny and then some! God Bless! This is a fabulous course.” Teresa Richardson, Proofreader. Buy it today, and the voucher code LINK will give you a 25% discount! Sounds Great But I'd Like to Know More! Don't forget to make a note of the voucher code LINK before you click the button!